Syria’s Assad can make claims, but making them happen is another matter. In Syria, the Muslim Brotherhood is basically in opposition to the Assad regime there. Since the Bible suggests that Syria will support the coming final King of the South (Daniel 11:40-43; Ezekiel 30:1-8) and a change in or from the Assad regime will be necessary for this to happen–and it will come to pass. 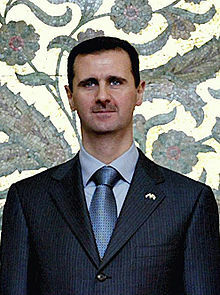 Syria’s Assad will either change, break his commitment to not step down or go into exile, or die. Interestingly, many consider that Iran is ran by Islamic extremists, but since the leadership there is Shi’a Muslim, apparently Bashar Assad will not consider them as Muslim extremists. The reality is that the Muslim Brotherhood is mainly a Sunni Muslim group, while Syria’s President Assad is Shi’a Muslim. Iran, President Assad’s closest ally, is mainly Shi’a Muslim. The Shiites may wish to stick together, but Syria simply will not remain led by Shiites unless the Sunnis switch their faith (not very likely). Hence, I do not believe that Bashar Assad will be able to wipe out all the Sunni Muslims that oppose him. Yet, partially because of the internal civil war in Syria, if it escalates too much more, Syria’s President Assad may decide that attacking Israel, probably in conjunction with support from Iran, is his best carnal option (which could include supporting Iran if it attacks Israel or Israel attacks it). Attacking Israel, however, will not be his best option (he should repent and probably leave office), though he may do that. 1 The burden against Damascus. And it will be a ruinous heap. (Isaiah 17:1). Damascus will be destroyed and Syria will change. An Islamic confederation that will include the land of Syria is coming (Daniel 11:40-43; Ezekiel 30:1-8; Psalm 83:4-8) is coming. Statements from President Assad and Iran will not change that. When Will the Great Tribulation Begin? 2013, or 2014? Can the Great Tribulation begin today? What happens before the Great Tribulation in the “beginning of sorrows”? What happens in the Great Tribulation and the Day of the Lord? Is this the time of the Gentiles? When is the earliest that the Great Tribulation can begin? What is the Day of the Lord? Who are the 144,000? This entry was posted on Friday, March 22nd, 2013 at 3:01 pm	and is filed under Religious News.